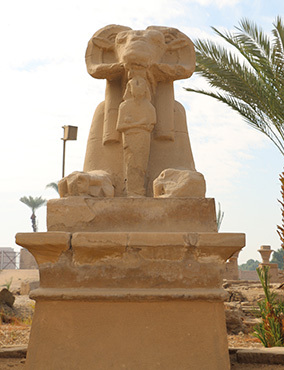 Egypt, a country linking northeast Africa with the Middle East, dates to the time of the pharaohs. 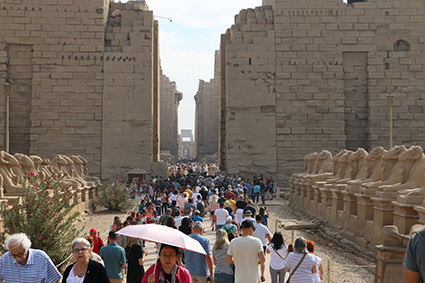 Millennia-old monuments sit along the fertile Nile River Valley, including Giza’s colossal Pyramids and Great Sphinx as well as Luxor’s hieroglyph-lined Kanak Temple and Valley of the Kings. Many people have thoughts of taking the trip of a lifetime to a faraway place at the other end of the Earth. And then you have those who imagine their dream vacation and are relentless in making it happen. 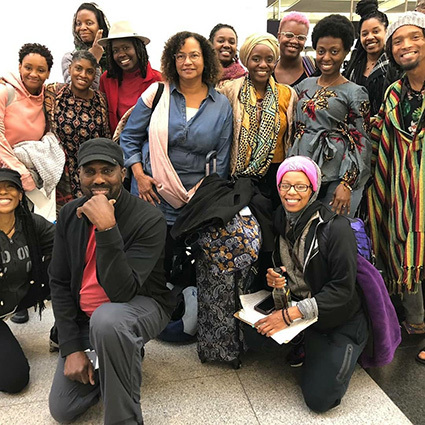 That describes Gaile Ferguson, owner of Captured by Sacred Photography — a single mother who has raised six children, and a grandmother of two who joined her Kemetic Yoga class on a trip to Egypt. 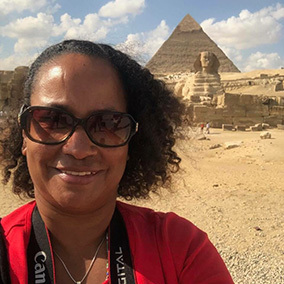 She shared her incredible experiences and photos, and sat down with Black Image to discuss her journey to Egypt. How did your trip to Egypt all materialize? I met with my Kemetic Yoga instructor here in Vegas, and that is how the opportunity presented itself. He told me about the trip, and initially I thought I couldn’t afford it — but I was hired to do a major photography job, and instead of doing something else with the money I received, I just paid for the trip. Have you ever been out of the country before? I visited Jamaica before, but it was just like going only to one place and then coming home. My trip to Egypt made me feel like that was the first time I ever went out the country. It was really a big deal for me. When I gave all my passport information for the trip, I thought to myself, “Oh my God! Wait what are you doing, Gaile?” I had those feelings of reservation that people often have when doing something you never thought you would do. Also, people close to me were sending me stuff about Egypt saying that it was dangerous. I had to tell everyone to stop because I knew I was traveling with someone who travels abroad frequently. And measures were in place for the group that I was going with that consisted of security, our own driver and tour guides. I knew that it was going to be fine. But you can’t help but have a little doubt sometimes. We stayed for 10 days. We first flew to JFK Airport in New York and then flew to Egypt. That was a 10-hour flight. How did you occupy yourself on such as long flight? Egyptian wall paintings completed over 5,000 years ago — and the paint is still vibrant. What’s interesting about me is that I don’t need to be entertained. I can read, think, and sleep. Honestly, I spent two nights on a plane. I left on a red-eye to JFK Airport and arrived at 6 a.m. The flight going to Egypt from JFK Airport didn’t leave until 6 p.m. So right there it was a 12-hour window of doing nothing. The EgyptAir plane was an experience all itself. I had never seen a plane that big before, and the cultural experience started as soon as we boarded the plane to Egypt. The way the men and women were dressed was so different from what you experience in the United States. What advice would you give to those who want to break out of a box and travel to another country? I would say don’t be intimidated by the illusions you might have about another country. Do your research and talk to others who has traveled abroad. It is great to travel and experience different things, people, and places. Go for it! Especially when opportunities come around. For me the opportunity came when I actually received the money to pay for the trip. My trip can be looked upon as extravagant, but it was the first time I ever thought about myself. Sometimes you do need to put yourself first. Yes, I had feelings of guilt because my youngest is 16 years old and I am taking care of my seven-year-old grandson. But my oldest children — who are 28 and 25 — came home to watch them while I went on my trip. What are your thoughts about the belief that ancient Egypt was built by aliens from another planet because no explanation has been given for the advanced Egyptian architecture? I personally have heard this theory, but what’s unique about my trip is that an architect traveled with us. To answer the question, I don’t believe that aliens were responsible for the Egyptian architecture. I think what is challenging to a lot of Americans is the thought that human determination and communal intellect can’t be responsible for the development of ancient Egypt. I disagree with this belief. I think that the advance development of ancient Egypt began with the ancestors and generations didn’t just cut off their teachings, they built upon it which developed into an advanced method for math, concepts, and unity. They accepted and respected their elders, and held on to the teachings that built the country. For example, there is an Egyptian courtyard with very high pillars that are over 2,000 years old. Each one of the pillars are perfectly straight and are of the same height. There are almost 133 pillars — and even though the ground isn’t flat, the pillars stand at the same height. They had a system and their greatness is so deep. Despite the obvious damage, we can still see us in the face. 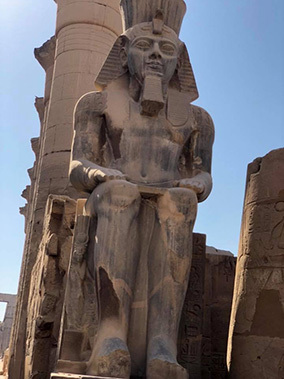 So, you believe because of the Egyptian culture of unity and respect for the Egyptian ancestors, generations were able to just build upon what they were taught. And that is why Egypt grew to such magnificence? 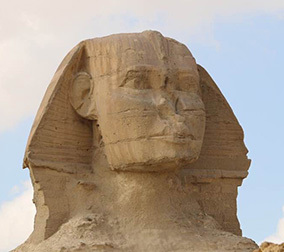 What were some of the cultural links between African Americans and the Egyptian culture? I think the communal characteristics that African-Americans possess stem from our motherland of Africa. Egypt is Africa — and many of the Egyptians we saw walking down the street in Egypt would say, “hello, my sister” and “hello, my brother,” as they passed us. I think African-Americans in the South have more of a communal instinct, but I do think black people everywhere are trying to get back to community — knowing and respecting Auntie down the street, and loving our sisters and brothers. I think we as African-Americans are trying to get back to communal activities. The Egyptians have a great sense of community. 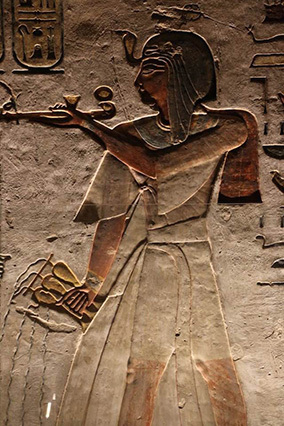 Another thing that we recognized is that women hold a very high honor in ancient Egypt. 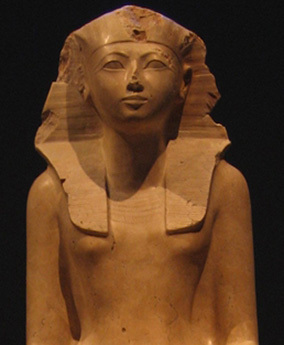 In the Valley of the Kings in Egypt there is one queen, Hatshepsut, buried alongside the kings. She was held in such high regard that there is also a Valley of the Queens in Egypt. Gaile Ferguson with her traveling companions.